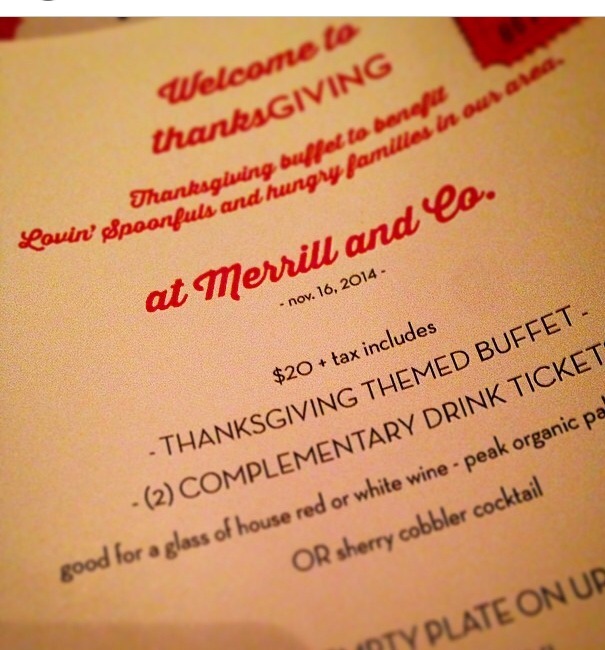 thanksGIVING at Merrill & Co.
Last night, Lovin’ Spoonfuls and Merrill & Co. presented ThanksGIVING, a holiday themed event which raised funds for our turkey distribution to support Boston Medical Center’s food pantry. As our community partners’ needs continue to skyrocket each year, unfortunately their resources and aid continues to shrink – and we at Lovin’ Spoonfuls find ourselves in a unique position to help facilitate direct distribution of holiday turkeys to families who utilize BMC’s food assistance. 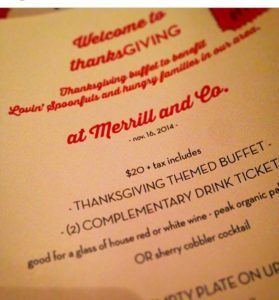 Along with the support of Boston’s incredible restaurant industry, and our wonderful hosts at Merrill & Co., over $2,500 was raised over a southern-tinged Thanksgiving style meal, with all of the fixin’s! Peak Organic brewery offered delicious Pale Ale, and bar manager Kevin Mabry created a sherry cobbler cocktail, perfect for the season. Thanks to all for such a fun evening!